Stage lighting equipment is increasingly cheap to buy. 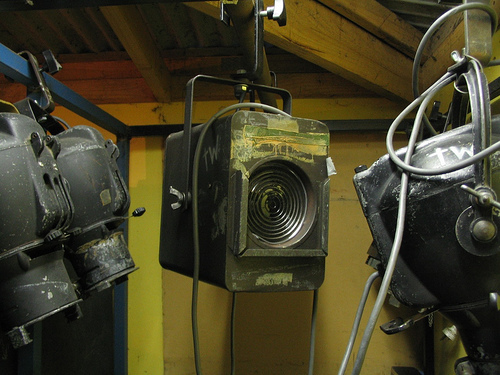 This means that some new lighting equipment, intelligent lighting in particular, is now within reach of your youth group, drama society, school or church hall. The question of “What Intelligent Lighting Should I Buy?” is often asked when the time comes to upgrade your existing lighting rig. But there are some things to consider before you go on your shopping spree and blow your budget on buying the latest in cheap intelligent lighting. Do we need to buy intelligent stage lighting? Do you think it’s time to upgrade your stage lighting? Having secured for bit of cash to spend on buying new lighting gear, you just can’t wait to have a look through those catalogues and trawl the web for affordable DMX goodies. But before you start adding that adding those Var*lites to your Amazon wish list, let’s back up a bit. What kind of shows do you need to buy this lighting kit for? Many non-professional groups have a wide range of lighting requirements, from a “vicar spotlight” through to the next staging of “High School Musical” and often flexibility is a big concern. That’s OK then, intelligent lights are really flexible aren’t they? They can do colours, gobos, move around, strobe, focus up……..
Buying a large number of profile spots and fresnels with barndoors can be just as flexible. Everyone wants to learn more in their chosen field and stage lighting is no exception. The thought of being able to buy some lighting equipment that you can really try out and get to grips with seems a lot more attractive than buying another ten of the those boring old 500w fresnels. You can try out and learn more types of intelligent stage lighting without actually buying it. No, that’s not some kind of cool moving gobo but what happens to your budget once you make the move into intelligent lighting. If you could afford, for example, to buy two moving lights for your group you will still probably need to buy a lighting desk that can control them effectively. And some DMX control cables. And some mains cables. And buy a spare lamp. An what happens when one of these pieces of highly advanced lighting kit stops working? Repair costs can be expensive if you don’t have the skills in-house. The problems of maintaining equipment are not exclusive to intellient lighting equipment but they do require more skills and money that if you were to buy more conventional stage lighting. OK, so you against me buying intelligent lights, then? You guys get to use all the cool kit, while we just have to put up with boring old rusty floods. Not at all. Buy some new Source Four Junior spots, some more fresnels and , most importantly, a good stock of accessories such as gels, barndoors, irises, floor stands etc. These could double/triple the usefullness of your existing lighting rig and you might not even need any more dimmers or to buy another lighting control. Just plan to “pair up” your stage lights so they fit into your existing control system. And don’t forget to spend a bit of money to get your existing kit fixed and working for you again. Then get down to your local lighting hire company and start snooping around to see what intelligent lighting gear you might need to use on your next show. You might even get a demo and a bit of a play around – free of charge! LED Stage Lighting – Why Buy LED lights? Hey rob our school as jjsut got a bit of funding in the tech deparpmenrt. I have helped the guy who is choosing the gear and we are getting. We are getting the Service tech at school to make a USB to DMX thingi. We all reddy have the cables from a previous production. Hi Nick, although the opinions on moving lights in schools of myself and many others in lighting are pretty well documented, it all comes down to what you are going to do with them. I can see a possible situation where a couple of small moving heads, hung in a useful place and properly programmed could provide some flexible light sources for a school’s many requirements (assembly spots, disco waggle, colour on stage etc). As far as being flexible goes, plenty of schools are buying cheap LED PARs to provide them with low energy colour washes and little maintenance while being fairly easy to control. The thing that springs to mind regarding looking after the kit (assuming that the school has the skills permanently and they are not going to leave at the end of a year) is the cost and availability of parts. Oh, and the quality of the secondhand Mac250s. In my experience, there are plenty of secondhand moving lights around, a certain lighting company specialises in installing Martin ex hire stock into new installs… but I digress. The point is, ex hire stock kit has always been thrashed, even if it’s been serviced and tarted up before shipping. It’s sold on for a reason. So, why not think about the flexiblity and eco brownie points of LED colour washes as well as working out if you need an extra n number of 500w PCs or additional rigging positions/sockets. If you had those PCs where would the go and how many functions might they perform? As a general rule in any school, there’s a whole raft of lighting goodies I might have on my list before 4 MAC 250s. Thanks for your question. I am making a low budget film here in Africa – and need additional lights. I had a set of red head (ianaro) and want blondes and those small led lights, and fresnels. It has to be fairly used (cant afford new) maybe exrental..intelleigent lights will be nice. any ideas. I will pay in the UK…(have a home there) Can u help? My opinion is that you need a mix, if you already have a lighting grid installed then even better. Use conventional lanterns to give washes and fixed spots. And then use Moving Head lights with iris, zoom, focus and dimmer (e.g. Martin Mac 575 Krypton) as these are very flexible in their applications. You may also want to use LED par cans as they have a full range of colours available to you. it however is entirely up to you. And depends on the style of performance if it is a musical then obviously go for the intelligent lighting, if it is a traditional play then go for more conventional lighting, if your performance is promanard (excuse the poor spelling)then inteligent lights are the key to success. The school i am in i currently doing a promanard performance and moving lights are used in it to great effect. I am writing a report to a theatre where I provide technical services. I am trying to explain 1. why an intelligent lighting system is better than a conventional lighting system in a performing arts center? 2. why add conventional light fixtures to a theatre that is fully using an intelligent lighting system? If you desire to get much from this piece of writing then you have to apply such strategies to your won weblog. What would you recommend about your put up that you just made some days in the past? your latest post on twitter aand got a lot of good feedbacks.